Esu Crossing the Middle Passage, by d’bi young anitafrika, playing at the Storefront Theatre, is a show with a bitter pill to swallow at its heart. 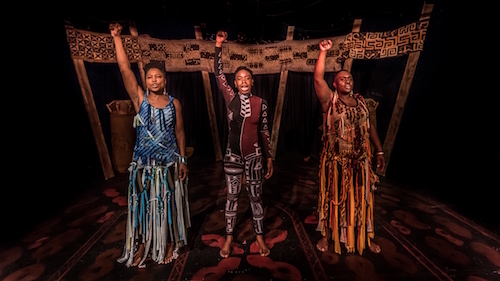 Focusing on the African slave trade, and linking that past horror with current problems of racism and forced diaspora, the show delivers blunt truths in the form of repeated ritual. It is not, perhaps, a “fun” show, but it is often absorbing and sparks a necessary conversation. Esu is known as a trickster god, but if there’s a trick played on anyone here, it’s the people who were sold into slavery and forced into a land where they were allowed little dignity and fewer rights. Don’t expect a mischievous external creature or character pulling the strings; while Esu is invoked and called to, he is demonstrated less by an external force and more as an internal presence. Esu here represents the crossroads, or the human ability to choose, regardless of what might seem like a lack of agency. The show begins in the small, crowded theatre lobby, with a masked dance, (attention-grabbing but slow), after which the audience is led into the beautifully decorated performance space (by Rachel Forbes), including a painted floor and drums, the presence of which is said to contribute to the audience’s safety. Costumes (Holly Lloyd) are lovely, particularly the symmetry of young’s leotard, which is, thematically, thrown off by one jagged edge. The lobby sightlines are not great. Edge nearer to the action, though be aware that you may be the recipient of an up-close-and-personal encounter. The performance begins suddenly; you may want to remove your coat as you walk, because you may not get a chance to take it off once you sit down. The many stages hereafter include an extended alliterative poem calling out for Esu from the belly of the slave ship, a ritualistic anointing of the stage with water, and a movement piece to the story of a border crossing gone horribly wrong. It’s clear that young is a powerful performer both vocally and physically, and her cries are heart wrenching. She is ably backed up by a pair of singers (Amina Alfred and Tuku Matthews), who provide a score to the proceedings. I found myself wanting to know more about these supporting players, hoping they would be given a chance to speak out, as well as sing. The singing was the highlight of the piece to me; the blend the vocalists achieved was essentially perfect, and the power and beauty of the music washed over me, linking pieces that otherwise might seem more disjointed or too repetitive. There is a lack of narrative and character here that, while not the point of the performance (the point is the ritual, repetition and reliving), creates a bit of an emptiness at its core. As a statement, it’s quite strong; as an experience, it feels loose, not completely tied together, which sometimes makes the journey seem more for the performer than for the audience. At one point, young wonderfully transforms herself into an eager granddaughter, talking her grandmother’s ear off with questions. She personifies the endless possibility of children that Esu loves; so many choices can be made. This is the most moving and entertaining part of the show: powerful, but a relief after so much pain. As young lights up, so does the audience, responding strongly to the character. This is part one of a trilogy (upcoming parts, about the present and future, will be in May and June at different theatres). Though the focus here is on the past, everything is still painfully relevant: the chanting of infuriatingly terrible laws against slaves brushes up against current atrocities involving prison statistics, the date “2016” ringing like a bell of condemnation. You’ll probably want to contribute to Black Lives Matter after you leave; the protest is just a few miles away. Performances are at 7:30PM Tuesday-Saturday, with a 2:00PM performance on Sundays. Tickets are $25 (plus service fee) and can be purchased online. Pay What You Want performances are on April 6, 10 and 13. After every show there will be a short talk back discussion; on April 10th there will be a longer post show discussion with invited guest speakers hosted by Watah Theatre.